WHAT kind of words do you use? Do they create energy and make the person you\'re addressing to special? Or are they humiliating and can drain the energy to the point that you spoil his or her day? Whoever you are, you have the access to the power of making the person happy by using a language that is pleasing to the ear and can heighten the spirit of one\'s soul. Many of us may not have realized that if we use positive words, it enriches not only the person we are speaking to but also ourselves. When you use positive words of affirmations, you will vastly enrich someone\'s life. In the process you\'ll also enrich your own spirit. The remarkable fact is that dignity affirmed works like a boomerang. When you affirm someone, you feel affirmed yourself. Suddenly you feel that you have done something wonderful. And, indeed you have. You have helped restore someone\'s respect and that is a priceless gift. Words are meant to be tools to create a positive relationship that meet everyone\'s honest need for respect. The use of language, our choice of words, is crucial in the whole self-esteem process. The saying: 'Sticks and stones may break my bones, but words can never harm me,' is definitely not true. Words can devastate a person; can lead to rejection, alienation, loneliness, bitterness, brokenness. Words can be emotional bombs, swords, bullets. Or when used reverently and sensitively, they can encourage, comfort, inspire, redeem, and create. 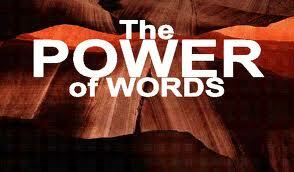 Yes, words have immense power to affect the way we feel about ourselves. The epidemic of low self-esteem in our society has been brought on or aggravated by the epidemic of profanity. The horrific infection of demeaning words has proliferated in our society like a plaque. Real profanity is the use of language that strips people of their dignity, embarrasses them, and humiliates instead of affirming them: generating emotional blockage in the creative process. Words like 'stupid,' dumb,' 'bad,' idiot,' dirt ball' and other dirty words abuse the holy gift of language, for using something meant to create self-respect and turn it into a weapon that destroys human dignity. To create and enhance the self-esteem of a person, you can change a person by using positive words that release positive mental pictures of what he can become. The gift of the language is the tool to create positive relationships. The creative use of words sustains positive creative relationship between ourselves and other persons. The healthy relationships stimulated and sustained through the appropriate gifts of creative language will go on to feed our mutual self-respect.